Be sure to share your projects from this past week on our Finished Friday linky. :: I love these No-Sew Tea Towel Café Curtains. Please click through to the original source before you pin. :: Our kids would have so much fun with this hallway play tent. Today's Question: What good reads or great ideas have you come across this week? Please share a link in your comment. Today’s guest post is from Jakob Barry. Although our beautiful world appears as if it has an abundance of water the truth is only a small amount is fresh and drinkable. For this reason it’s important to educate our children about water conservation at an early age and since spring is upon us there’s no better place to try this out than in the garden. Gardening is a great activity for teaching kids tips on saving water because when they help take care of vegetables, herbs, or flowers they have a stake in the outcome. It’s an experience they can carry with them and act on in the future if desired. At the very least the skills they pick up learning about conserving water while feeding plants can be integrated into many other facets of life year after year. The best time to feed the garden is in the early morning hours. That’s when water has the best chance of moistening the ground around roots giving them the necessary strength to carry plants through the hottest parts of the day. Mid-day feeding under the hot sun means quicker evaporation rates leaving plants more at risk. The result may be gardeners having to feed them again. Sometimes mornings in many households can be hectic so it’s understandable if this isn’t a great time to send the kids into the garden. That’s why one option is to turn morning feedings into a group effort by scheduling days for each family member to take a turn. That way parents and kids have equal participation in trying to conserve water. Meanwhile, the second best time to water a garden is in the early evening either before or after dinner. Just know that some pest control authorities in wet regions will tell you the more damp a garden is at night the higher the chances of attracting unwanted critters and fungi. When this occurs vegetation can be harmed so the best advice is to try keeping leaves on the dry side. Once you have the timing down learning how to water should be the next step. You see, just about every homeowner has a garden hose and it’s very easy to grab the handle, aim, and spray the entire yard. What’s hard is actually hitting the target which is the base of plants near the roots. Unfortunately even on low settings hoses don’t deliver well. When feeding, kids should use watering cans or an empty plastic bottle to help distribute water as close as possible to plant trunks so it can flow directly to the roots. Otherwise water gets wasted elsewhere and can actually help feed weeds and other unwanted undergrowth. The concept here is teaching kids that unless it’s raining plants should be fed with precision and not drenched. Another way to save water is reuse it from wherever possible. That way there’s less of a need to access the tap. Some examples include leftover tea, collecting cold shower water while waiting for it to heat up, and even water collected from a leaky air conditioner. Whatever the source have kids always keep in mind that wherever there’s extra water it could be used in the garden. After a while they may even find other uses for leftover H2O. Finally, mulching around plants is a great option for saving water in the garden. When placed on the ground mulch acts as a barrier shielding soil from the hot sun, prolonging moisture. Kids can help make homemade mulch from a variety of organic and commonly found materials such as wood chips, brush, and dry branches. It’s another gardening practice that shows them how to extend one feeding into the day so plants hopefully don’t need to be fed again till the next morning. Jakob Barry is a home improvement journalist for Networx.com and blogs for plumbers across the U.S.
Today’s question: What tips do you have about conserving water in the yard or garden? Check out our other tips for Gardening with Kids. I first saw the idea of a Christmas Card Holder Wreath in December, but knew I wouldn’t have time to make it before Christmas. At the time I thought I’d simply pack the idea away until next Christmas. But then I noticed that we tend to get a lot of greeting cards all year long. In fact, right now we have about a dozen birthday cards, anniversary cards and thank you cards. I love seeing the cards and being reminded of people we love both near and far away, but our small home doesn’t afford any space for displaying these cards…or does it? I decided that I could easily adapt the Christmas Card Holder Wreath to be a year-round card holder wreath simply by changing the colors. First, I dyed my clothes pins black. I filled a stainless steel bowl with very hot water and dissolved 1 pack of Black Rit dye in the water. Next, I added my clothes pins and let them sit for about 45 minutes. Once the wreath was as large as I wanted, I used the pliers to make a loop on one end of the hanger wire. Then I pushed the clothes pins and beads toward that end as much as I could and used the pliers to make a hook on the other end of the wire right next to the last bead. Make sure you have a clothes pin on the beginning of the wire and a bead on the end. I simply hung the wreath on a nail because I couldn’t decide what color ribbon would look best (and I was anxious to get those cards displayed). I think a bow at the top with the ribbon ends hanging down into the middle of the wreath might help fill that empty space. What do you think? Now I have a card holder wreath that I can keep up all year long. Today's Questions: What color ribbon do you think would look best on our card holder wreath? How do you display greeting cards at your house? I'm trying to hold myself accountable to finish some of the projects on my to do list by posting each Friday about a project I've completed. Would you like to join in? Link up to your own projects below. 1. Link to your project post, not your blog's home page, so we can find it easily. Here are some parties we'll be linking to. Check out all of my Pinterest to Real Life experiences in my Completed Pins board. I pinned this idea from Alpha Mom into my Spring board a few weeks ago. Kristin saw my pin and the planning began. We decided to meet at her home to make cherry blossom paintings with our 9 children (well, actually 8 since the baby didn’t get anywhere near the paint). Last week, all of the littles filled Kristin’s table and painted away. First, they painted tree branches or whole trees with brown paint. Then, they got busy stamping pink flowers with the bottom of the bottles. Our bottles didn’t make the center part of the flowers, but the kids didn’t seem to mind very much. Emahry chose to use a paint brush to go back and paint the centers (and some letters). It was lots of fun seeing the kids’ personality differences come out while their were crafting. Some were exact and wanted their finished product to look like the original while others took the materials and went in their own unique direction. Everyone had a great time creating! Check out some more great Spring ideas and even more Kids’ Art Activities and Craft Projects. Today’s Question: What crafty project have your kids done recently? We’ve just updated our About Us page. Why don’t you click on over to learn more about our family. # 473. Free wood for building a chicken tractor from an old chicken coop. # 475. Jonathan’s four favorite vehicles in easy to do wooden puzzles. # 476. A warm evening bike ride. # 478. and hanging out with the family outside (in a laundry basket so she wouldn’t eat the grass). # 480. New family photos. Today's Question: What is one thing you are thankful for today? Thanks for stopping by A Heart for Home! You can easily get free updates through e-mail or our RSS feed. We hope you'll be back often! :: I can’t wait to try these tasty looking (banana sweetened) cookies. Please click through to the original source before pinning. :: I have the ingredients for cloud dough ready and waiting. I’m thinking about a cloud dough table on the patio. Today’s project was inspired by this adorable Spring Baby Grass Wreath I discovered on Pinterest. We needed a new spring themed wreath that was easy and inexpensive to make. I reused the pipe insulation from my last wreath to make the wreath form and used this yarn wrapped wreath trick to make the wrapping a lot faster. I purchased the lime green “eyelash” fun fur at Michael’s with a 40% off coupon and had the flowers and ribbon in my craft stash. For more spring inspiration check out our Spring Theme board. We also have a Front Door Inspiration board filled with ideas to keep your front door happy. Today's Questions: How have you decorated for spring? Feel free to share your links below or in the comments section. free updates through e-mail or our RSS feed. If you’ve join Pinterest, you’ve probably see how it can easily become a time sucker. I love Pinterest, but to help manage my time online I needed to minimize the inspiration overload of my Pinterest home page. Many times I simply go on Pinterest to find something I’ve previously pinned. But instead of going straight to the board where my pin was housed, I’d wander through the pins of those I follow for a few minutes (or more) first. So, now, when I need to find something I’ve pinned I simply type the pinboard name into my browser and go straight to the appropriate board. This way I’m able to bypass all of the new pin distraction and get right to what I’m looking for. 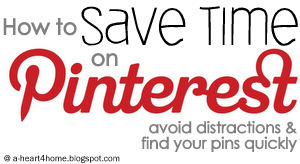 To go straight to a specific board simply type pinterest.com/your personal Pinterest URL/your board name. Dashes are placed between words and in place of apostrophes in the board title and symbols are omitted. You can easily find the URLs by looking at the address after you’ve click through to a specific board. Here are some examples of my boards and the direct URLs. By going straight to the board I need, I’m able to avoid wasting time and find the information I need more quickly. This is one of the ways I make Pinterest work for me. Today’s Question: How do you deal with or avoid time wasters online? Four years ago, my mom suggested to my husband that he should plant a garden. We had just moved to a house with a good chunk of land and my husband was eager to try his hand at growing our own food. My dad is an avid gardener so he came out to our house almost every Saturday during the spring to drop off some new seedlings or compost. That was the first year I tried to incorporate my crafting genes with my husbands gardening genes by making seed started pots out of newspaper. Now, four years and two moves later, my husband is still gardening. He absolutely loves it! Of course, there are a few complications now that we’re living in a town house, but he’s found creative solutions to still make gardening work for us. Our biggest garden plot this year is in the field behind the church we attend. My dad started tiling up garden plots a few years ago for anyone who wanted them and we are so thankful for the space to grow our own organic produce. Our three oldest children love “playing” in the garden. Last week, we planted carrots, green onions, snow peas, and a few flowers for Emahry. To make planting easier for the kids, Tim poked a hole for each seed and the kids followed behind dropping one seed into each hole. Then Tim went back through and gently covered the seeds. With little ones it also works really well to give them each a small shovel and their own little bit of dirt to dig in. For plants that need to be started indoors, why not let the little ones help you make seed starter pots out of toilet paper tubes? Older children can even help make some wonderful origami fold newspaper pots. Once the plants are a little bigger, our kids love to help weed. We like to give them each a small bucket and them tell them to see if they can fill the whole thing with weeds. Just make sure you show them which green things are weeds and which are plants! While you’re with your kids in the garden, use that time to explain why you’re gardening and what you’re doing. It’s amazing how much our children have picked up about gardening from these little conversations. Just the other day Emahry discovered a ladybug while playing outside and said she needed to put it in the garden so it could eat the bad bugs. When we get further along in the growing season, our children love to help harvest from the garden. We give them each a bowl or bucket and walk along the rows together trying to spot anything that’s ready for picking (or eating straight from the plant). Need some ideas to get gardening together? Check out these wonderful books. A Garden AlphabetSunflower HousesRoots, Shoots, Buckets, and BootsGardening with ChildrenKids’ Container GardeningFrom Seed to PlantThe Vegetables We EatThe Backyard HomesteadThe Vegetable Gardener’s Bible Other gardening posts: Saving Some Green in the Garden (frugal gardening)Seed Starter Pots from Empty Toilet Paper RollsSturdy Recycled Newspaper Pots Be sure to check back next week when we’ll share a guest post about teaching kids to conserve water in the garden. For even more great ideas check out my Backyard Homestead and Garden & Yard Ideas boards on Pinterest. Today's Questions: Does your family plant a garden? How do you get your kids involved? Please visit my fellow Tri-Moms, Kristin @ Bits & Pieces from my Life and Christy @ A Living Homeschool for more ideas on gardening with kids. We’ve been making these post for several years now and love how they are made from newspaper which most people can find for completely free. Check to make sure your newspapers are printed with vegetable based inks. If they are recyclable they should be fine, but it doesn't hurt to call your paper and find out for sure. These recycled newspaper pots are relatively easy to make and allow you to easily transplant seedling to the garden. By making pots this way you won’t need to use any tape, glue, string, or staples. These finished pots are also very sturdy. By the way if you have older children they can definitely help make these. We also have lots of other tips for gardening with kids. 1. Start with a single page of newspaper folded in half on the crease. 2. Fold the newspaper in half again, lining up the bottom and top edges of the newspaper. 4. Fold in half from the bottom up. 6. Fold in half from the left to the right. 8. Take the bottom right corner (blue flower in the photo) and opening up the flap, line the corner crease up with the crease in the middle. 9. Flip the whole thing over. 11. Pull the left and right flap that are face up together. 12. Pull the back two flaps together. You should now have a smooth looking "triangle" with no loose bits. 13. Fold the top right flap in so the edge meets the middle crease. Crease firmly. 14. Fold the same flap in again (kind of like a paper airplane). 15. Repeat with the top left flap. 16. Flip the whole thing over and fold both flaps in the same way as the previous side. 17. Fold the tabs that are facing up into the pot so that the top folded edge lines up with the sides. 18. Flip the pot around and fold down the other tabs. 19. Fill with potting soil, dirt, or seed starter and plant your seeds or seedlings. We normally make a large batch of newspaper pots at once. To keep the folded in tabs from coming undone, we collapse the first pot, folding the sides in like the sides of a gift bag and place it under a book. Once another pot is complete we simply place the first pot inside of the second. The pot inside is still collapsed like a gift bag and keeps the second pot from coming undone. Four collapsed pots fit nicely into one expanded pot. This also makes it easy to keep track of how many pots you have made since each group consists of five pots. Place your recycled newspaper pots on an old cookie sheet or tray that has a small side to keep pots from falling off. To transplant into the garden simply cut the bottom of the pots and plant the entire pot along with the plant. Make sure you dig holes large enough to bury the entire pot (having exposed newspaper can cause issue with moisture loss). Keeping the seedling in the pot helps protect the roots during transplanting and the newspaper will decompose in the garden. Today’s Question: Do you have any tried and true garden tips? We’d love to hear them? Find more great gardening ideas on our Backyard Homestead and Garden & Yard Ideas boards on Pinterest.